East Rutherford, N.J. • The Denver Broncos, so fortunate to be down only two scores, finally rediscovered their offensive rhythm and seemed on the verge of getting back in the Super Bowl. Instead, it was the Seattle defense scoring, and the Seahawks pulling away. Down 15-0 with more than 5 minutes left in the first half Sunday, Peyton Manning had driven Denver 52 yards to the Seattle 32. But on first down, offensive lineman Zane Beadles was penalized for tripping, and it got worse from there. On third-and-13, the Seahawks rushed four, but two linemen got to Manning. Chris Clemons was about to slam into the quarterback from behind, but Cliff Avril had already reached him after beating tackle Orlando Franklin. Avril struck Manning&apos;s arm as he was releasing the ball, and it wobbled through the air. Malcolm Smith was easily able to step in front of Knowshon Moreno for the interception. At 6-feet, 226 pounds, the linebacker outran the Broncos for a 69-yard return for a touchdown. Smith also had a fumble recovery to win MVP honors. On the INT, he said, his teammates had good coverage behind him, and he could see Manning focusing on the other side of the field until pressure forced him to look to his right. "The speed of the game, the way we attack, there&apos;s just opportunities all over the field," Smith said of the Seahawks defense. It was the longest Super Bowl interception return for a touchdown since Tracy Porter&apos;s 74-yarder late in the fourth quarter four years ago to clinch the title for the New Orleans Saints against the Indianapolis Colts. The quarterback he picked off? Manning. This year&apos;s game was over much sooner. 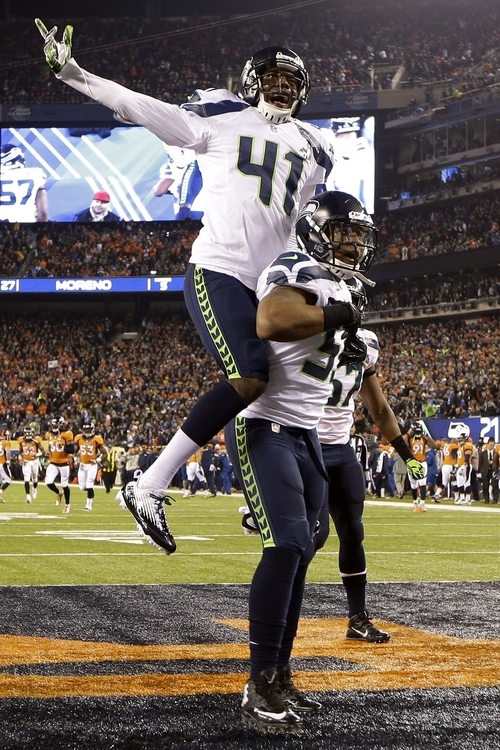 Smith dunked the ball over the upright in celebration, and Seattle led 22-0 with 3:21 left in the half. Manning could only shake his head on the sideline. "We knew if we could consistently put pressure on them, consistently get hits on them, we could affect the game," Avril said. "There is a reason why they were the No. 1 team in defense during the season," Broncos coach John Fox said. "Give them credit. They had a lot to do with it  with a combination of coverage and rush."